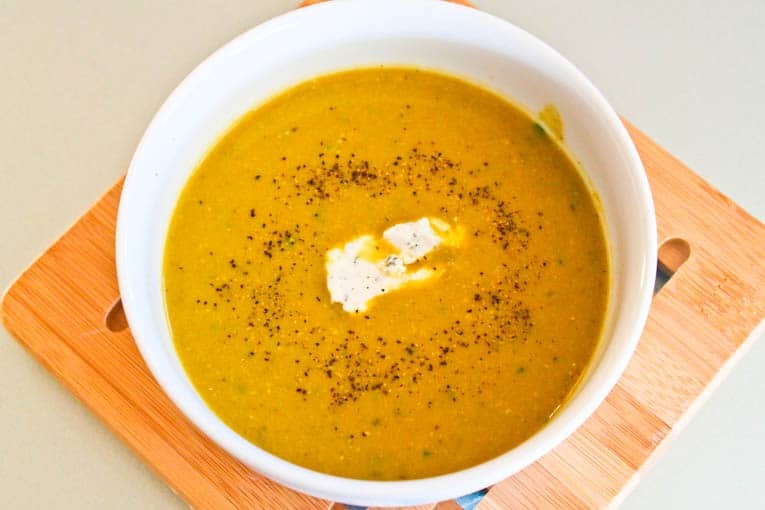 Soup in the summertime? Isn’t it too hot for that? Generally, yes. But if you live in or near San Francisco, you know that summer weather can be pretty finicky, as in – sometimes it’s cloudy and 60 degrees in July. That was the case this weekend – I remember telling the husband that it felt like Thanksgiving weather. That gloomy, colder than usual, makes you want to curl up with a blanket and a good book type of weather. So naturally, we were in the mood for soup. Instead of a hearty, stick-to-your-bones stew, I opted for a lighter soup using one of my favorite spring/summer vegetables: Asparagus. 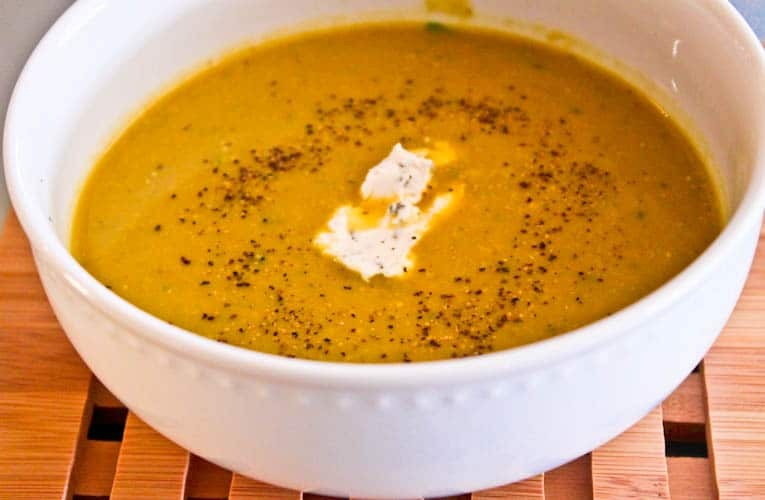 The husband likes vegetable soups, and he likes asparagus, but he doesn’t like vegetable soups that are more stock based (he prefers creamy vegetable soups – shocking right? 😉 ). 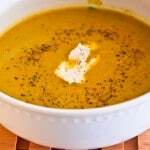 So I wanted to figure out how to make a creamy vegetable soup without using heavy cream. What did I swap in for cream? Yes, chickpeas, and it worked beautifully! The husband said that the soup was super creamy and had a great consistency. And instead of all the fat & calories that comes from using heavy cream, we got a ton of lean protein and fiber from the chickpeas. Win win. I did add a dollop of herbed goat cheese at the end though, I mean, you have to have a little bit of decadence right? Just 1/2 a tablespoon did the trick. 1/8-1/4 tsp crushed red pepper (for some kick)! 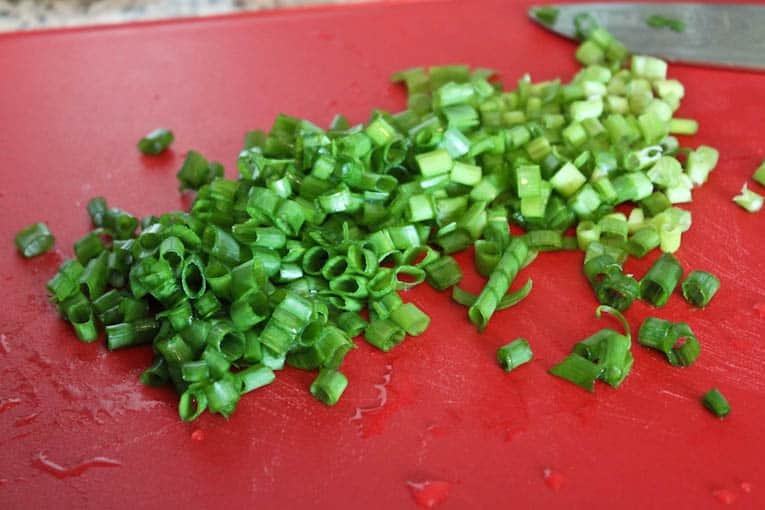 Step 1: Chop your veggies. In a large pot, add olive oil, onions and garlic over medium heat. Let mixture sweat, but do not let the garlic burn. Step 2: Once the onions have turned translucent (about 5 min), add the stock and chickpeas. Increase heat to medium high allow come to a boil. Add asparagus and cooks until tender but not limp. Add half of parsley, and all the spices (salt, pepper, crushed red pepper) and stir until incorporated. Step 3: Blend ingredients (I used an immersion/hand blender which worked great – I just took the pot off the heat and blended it in right in the pot!) If you don’t have a hand blender, you can use a regular blender, you just have to puree it in batches. 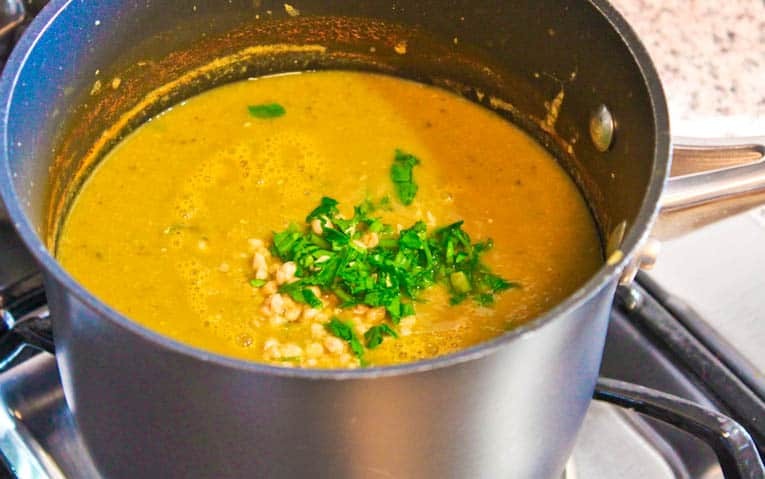 Once you’ve pureed the soup, add lemon juice, parsley and pine nuts. Continue to blend until combined. Step 4: Add salt and black pepper to taste, top with 1/2 to 1 Tbsp herbed goat cheese. It’s like a one pot meal: you get protein from the chickpeas and cheese, fiber from the chickpeas and asparagus, and just a great herby-freshness from the parsley and asparagus. It’s also extremely easy to make – you can have this on the table in under 30 minutes. And because of that, it’s a weekend meal that can also moonlight as a weekday meal. 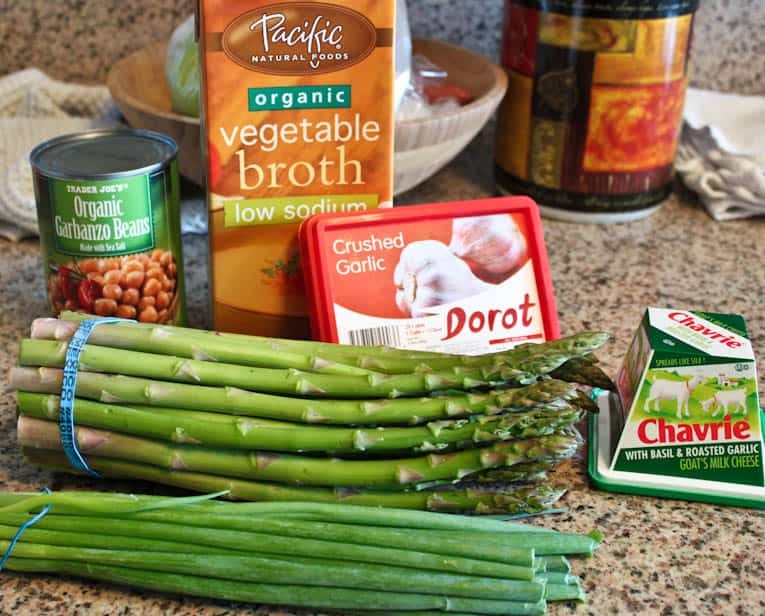 Soup can still be a great spring food. I lightened things up with bright spring asparagus and swapped out the heavy cream. 1/8-1/4 tsp crushed red pepper for some kick! Chop your veggies. In a large pot, add olive oil, onions and garlic over medium heat. Let mixture sweat, but do not let the garlic burn. Once the onions have turned translucent (about 5 min), add the stock and chickpeas. Increase heat to medium high allow come to a boil. Add asparagus and cooks until tender but not limp. Add half of parsley, and all the spices (salt, pepper, crushed red pepper) and stir until incorporated. Blend ingredients (I used an immersion/hand blender which worked great – I just took the pot off the heat and blended it in right in the pot!) If you don’t have a hand blender, you can use a regular blender, you just have to puree it in batches. 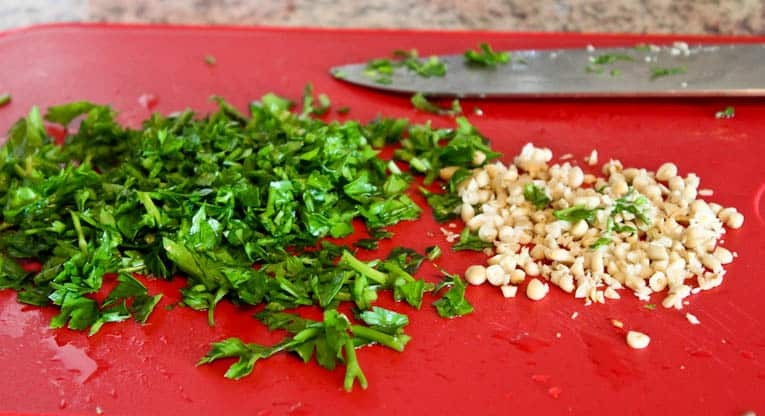 Once you’ve pureed the soup, add lemon juice, parsley and pine nuts. Continue to blend until combined. Add salt and black pepper to taste, top with 1/2 to 1 Tbsp herbed goat cheese. 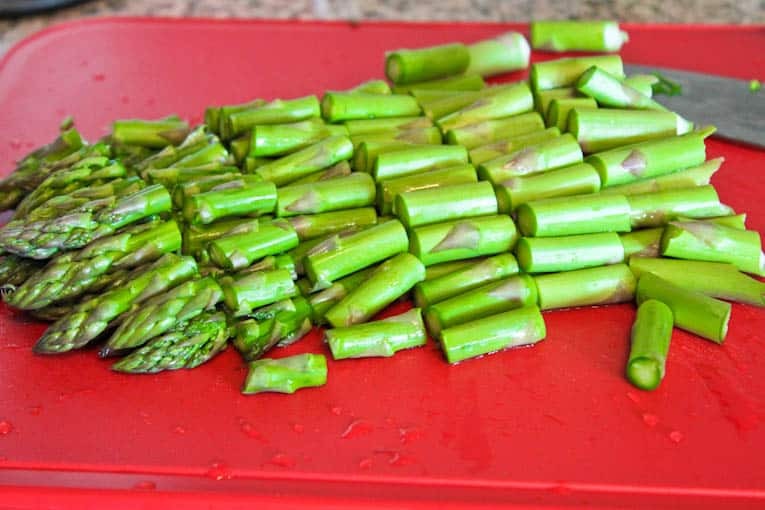 Since asparagus season is pretty much over in NE, can I use frozen asparagus? Absolutely! Frozen asparagus should work fine in this dish. 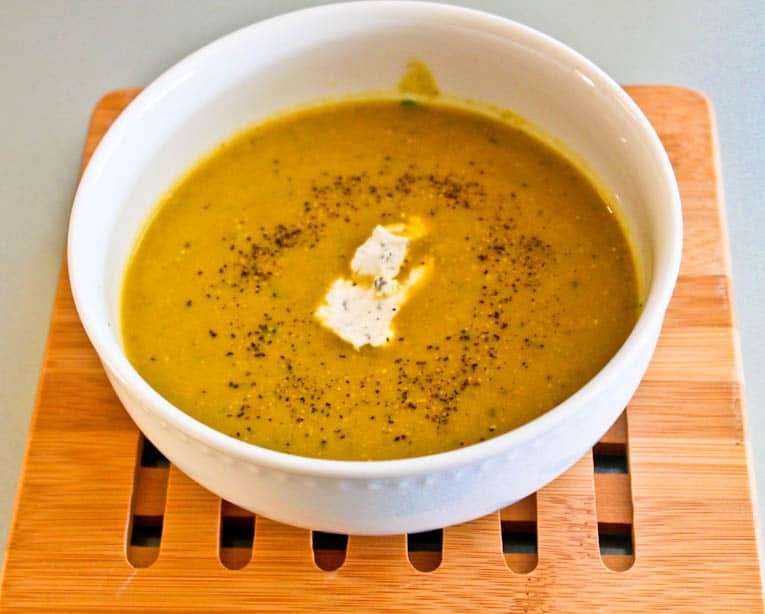 Hope you love this soup Tonja! This is my favorite soup by far! I am so happy I found this recipe. I always make a double batch so it lasts a while. I’ve made the recipe about 8 times! Thanks for posting this!!! Oh wow!!! That is so awesome Rachel! 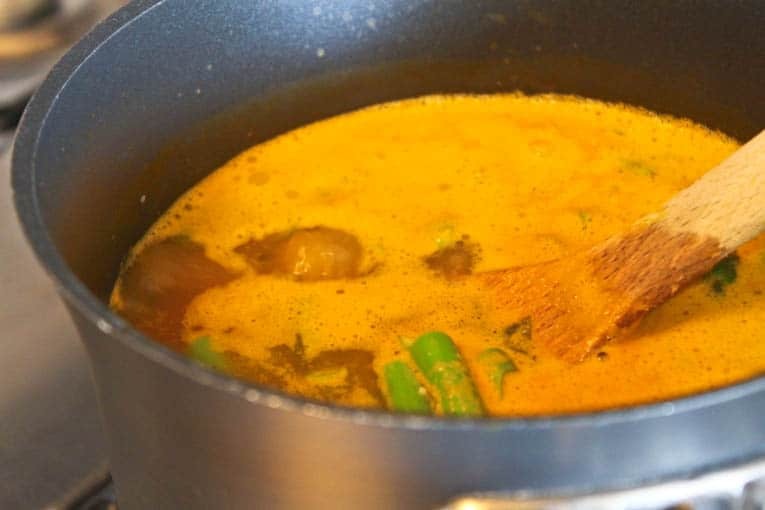 I’m so happy to hear that 🙂 I usually make double batches of most of my soups too — because they taste so great after the flavors have more time to blend together in the fridge! Hehe sounds great, thanks Ali! No problem at all Ali! You’ll have to keep me posted on how you and your hubby like this recipe! And congrats on starting your health journey! Let me know if I can help in any way or if you have any other questions 🙂 Happy healthy cooking! Do you know how many calories per serving this has, and how large the serving size would be? I’ll add this to the printable version of the recipe as well. Hope that helps! This looks amazing. The color is so gorgeous. Asparagus soup is usually so green that I can’t get anyone to try it but me. I will make this sometime soon. And most likely eat all of it. Thanks so much Erin!! The chickpeas make the color a little less green for this soup – and I agree it ends up looking gorgeous 🙂 Enjoy! I love soups and especially asparagus!! Great idea to use chickpeas. Love you blog! I love soup so much that I can eat it during hot summer months as well. What a great idea to use chickpeas. Thanks Kathy! 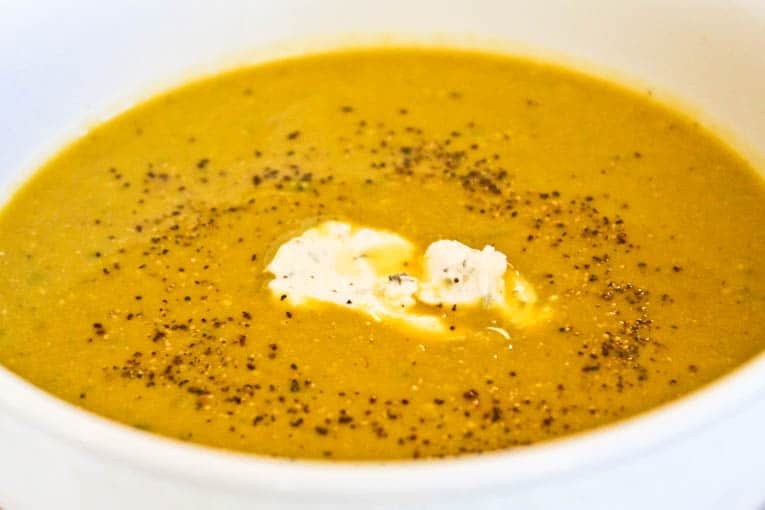 I’m with you – I can eat soup just about anytime of the year 🙂 I save my heartier soups for winter, and do lighter ones in the summer. It’s the perfect balance! So glad this soup was a success for you. It was one of the first soups we ever made. It has a very nice nutty flavor in each bite. Yum. Goat cheese is welcome anytime.